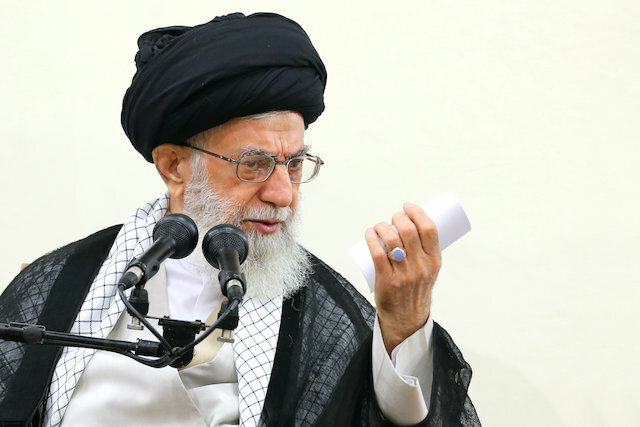 While western powers involved in JCPOA declared that the nuclear agreement was an international irrevocable contract, months before the US presidential election, the Leader of the Islamic Revolution had predicted the outcome on March 20, 2016: The U.S. presidential elections will take place in a few months –seven, eight months – and in nine months, the current American administration will completely change, and there will be no guarantee that the future administration will honor the few promises that the current administration has made. Notice that today, in all western countries and in all those countries that are under their influence, our banking transactions have been blocked. We have a problem bringing our wealth – which has been kept in their banks – back to the country. We have a problem conducting different financial transactions which require the assistance of banks. And when we pursue the matter, follow it up and ask about it, it becomes clear that they are afraid of the Americans. The Americans have said that they would lift sanctions and they have actually done so on paper, but through other ways and methods, they are acting in a way that the result of sanctions repeal will not be witnessed at all. What I want to say to officials and to the people is that the nuclear agreement – which has been referred to as the JCPOA – should not turn into a tool for pressure. It should not become a tool for the enemy to pressure the people of Iran and our country from time to time. We should not allow them to turn this into a tool for pressure. Officials have said to us that they would do such and such things so that pressures coming from sanctions are eliminated. They [the Americans] have not done what they had promised to do at that time and what was supposed to be done in the first day. Now, eight, nine months have passed from it, but it has not been done completely and it is incomplete. Our officials themselves are saying this openly. Those who were in charge of that task are saying this openly. Now, if they want to use it again as a tool for exerting more pressures on the Islamic Republic, this cannot be allowed. By relying on divine power and by believing in the power of popular presence, the Islamic Republic is not afraid of any power in the world. If someone says, “Indeed, we are to be overtaken!” [The Holy Quran, 26: 61] copying the weak morale of the Children of Israel, we too will say – copying Prophet Moses (a.s.) – “[Moses] said, ‘No! Indeed, with me is my Lord; He will guide me.’” [The Holy Quran, 26: 63]. At present, when they deliver speeches, the U.S. presidential candidates compete with each other in vilifying Iran. Well, this is enmity. Enmity does not necessarily appear in a strange form so much so that we can easily distinguish it. This is another reality. The arrogant outlook which the US has adopted and which has continued since decades ago until today has made all nations in the world have a feeling of mistrust and hatred towards the government of United States. This is not particular to our country. Any nation which trusted the US, received a blow, even those who were US friends. In our county, Dr. Mosaddeq trusted and relied on the Americans so that he could free himself from the pressure of the English. Instead of helping Dr. Mosaddeq who had trusted them, the Americans allied themselves with the English. They dispatched their agents to our country and they launched the 1953 Coup d’état. Mosaddeq trusted them and he received a blow for that. Even those who were on friendly terms with the U.S. and who had trusted this country received a blow. The Pahlavi regime had a very close relationship with the United States. However, the greed of the US exhausted them as well. As I said, they imposed “capitulation” – the judicial immunity of American agents – on this regime and they had to accept this because they had no other source of support except for US.